We went into this trip expecting it to be amazing, but there was no way I could have prepared myself for how epic it truly was. A few days in, I texted our friend Matt Minor (a world traveler who has been so many places, including Patagonia) and was like "hey, did you guys let us go to the most beautiful place on earth for our first big international trip? is it all downhill from here?!" and he pretty much agreed. We were just blown away by the huge glaciers, giant mountains, and never ending stretches of beautiful landscapes. Everything felt so alive, the glaciers always moving and breaking, the mountains always dancing in clouds, and the icebergs always turning. It was wild. I figure we'll end up writing quite a few blog posts, including summaries of different parts of the trip, advice on planning your own Patagonia trip, how to scout for a trip before getting to the location, and so on, but I wanted to start with a quick one - just a round up of our instagram posts and captions from the trip to give you an idea of what it was like if you missed following us in real time! A few years ago, I read a book called Enduring Patagonia by @gregory.crouch. I was really hyped on adventure climbing books at the time and I’m pretty sure it was a suggestion based on the other books I had purchased. I loved every single page. It was beautifully written and described the Patagonian mountains with such vivid detail. I became obsessed and would spend all my free time looking up photos of the area. 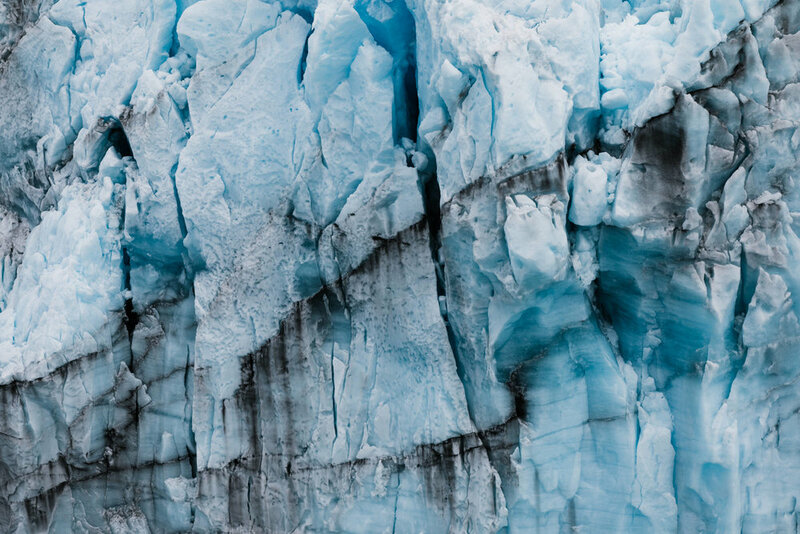 My obsession narrowed in on glaciers specifically, and I went through a phase of painting nothing but glaciers. I absolutely loved mixing the blues and nearly all of my clothes from those years have blue paint on them somewhere (even my beloved parka...a blue spot on the inside lining 😬). Some of those paintings are on #abbimade if you want to see them. 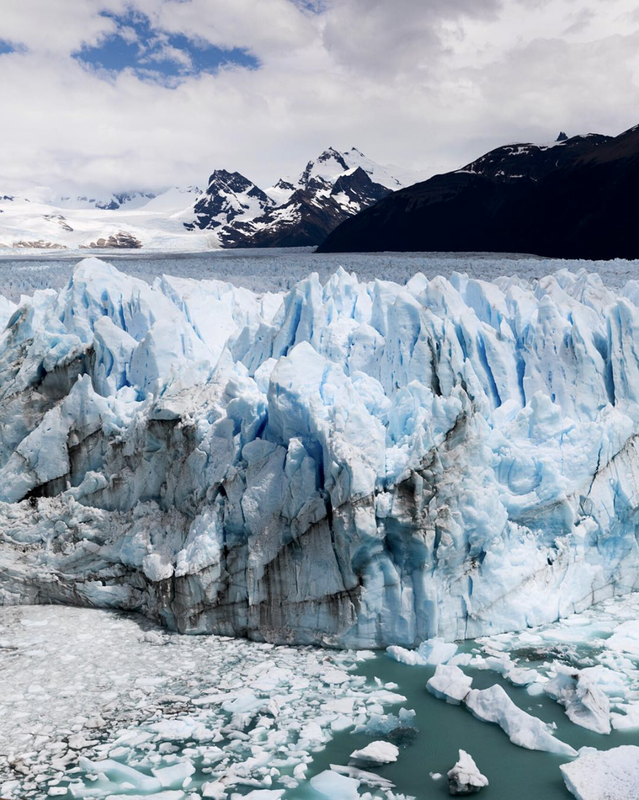 But the point of the story is this — I’ve seen a few glaciers in person since those years, but never in this way. Today, we got to walk right up and look across a narrow channel of gorgeous blue water at the 150 foot edge of a giant glacier. In Patagonia. It’s wild to look at so many photos of something, and spend so much time studying it and then finally stand right in front of one...it was so much more amazing that I had ever imagined. So Abbi really wanted to go to El Chalten after being in Patagonia for 24 ish hours, even though our gameplan had been to head that way at the end of our trip. Now she’s just obsessed with the area and is bummed that I want to explore other places. When you travel somewhere which of the following resonates with you? (A) Explore as much as humanely possible, or (2) chill and explore one place thoroughly. Needless to say, I won this afternoon and drug us out of El Chalten (I emotionally struggle to cope with bad weather...) and into the desert where we got shut down by terrible road conditions. Nevertheless Patagonia has solicited the hype. Here’s the end of hwy 23. And yes we put the packraft in. Patagonia update — we made it to El Chalten Thursday and it is absolutely amazing, but it’s famous for “the world’s worst weather” and has held to the name pretty well. We woke up yesterday morning, hurry-packed the tent in the rain, and started driving our tiny little rental down a dirt road running through the foothills. After 37 Kilometers of foggy forest, the bluest river I’ve ever seen, a few waterfalls, and high snowy peaks in all directions, we arrived at a beautiful lake and decided to get the new 2-person packraft out for its maiden voyage. I didn’t mind the rain one bit as we paddled around a pristine mountain lake surrounded by lush forests, cascading falls, and even a few glaciers up high. 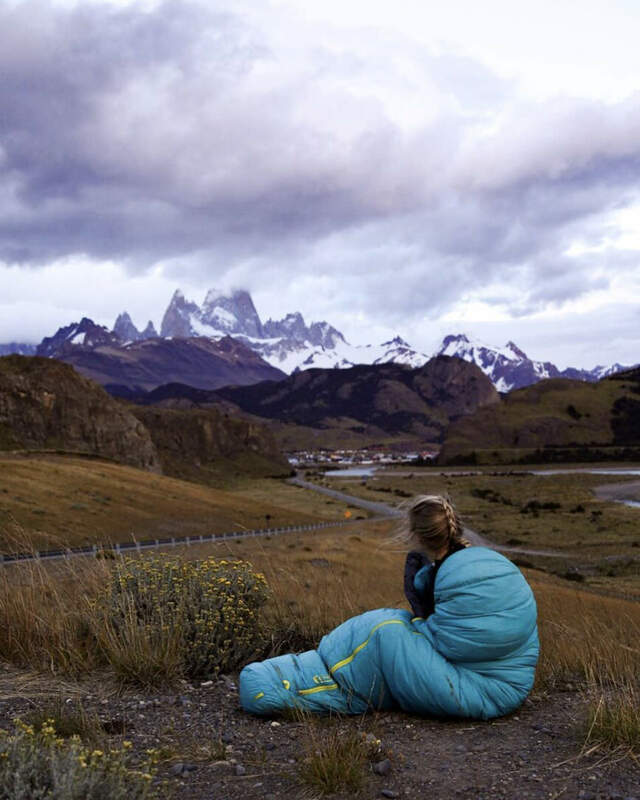 Patagonia is unreal. A blurry self-timer photo. Nothing about this is portfolio-worthy and I can find a hundred things wrong with it, but it captures the pure joy of the moment I finally laid eyes on that dang elusive mountain back there. It was quite the ordeal getting to see this beauty (I’ll probably write more on that later, but long story short I can be a bit obsessive about things and Callen is a saint for putting up with me), and it meant more to me than I anticipated before this trip (also another story for a different day...) but now I’m sitting here in some spotty WiFi at a gas station in the middle of nowhere wondering if the last 24 hours were somehow just a dream. I always knew I’d be in love with this place. It’s strange to finally know something you’ve longed for for so long. El Chalten, Fitz Roy, Patagonia, the whole thing...it’s stolen my heart. I’m gladly welcoming this skyline to the ranks of personal favorite places. So about Abbi fixating on a single exploratory objective.... She’s a lot smarter than my own self. We saw a good weather window and went back to El Chalten. We spent hours staring at this range, slept in the parking lot of an overlook, and watched the clouds move across these peaks from sunrise until they were hidden completely again. 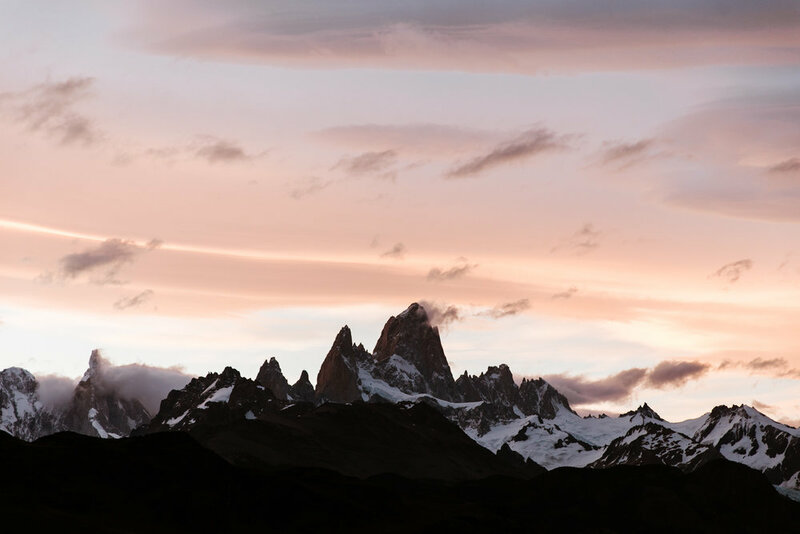 Tbh, most best peaks, also note the magnitude of Fitz Roy (aka The Mega Big One) Now let the road trip begin! I’m pretty sure every road here leads to a perfectly blue lake surrounded by mountains. There is so much to explore...it’s pretty overwhelming, but at least we get 16 hours of day light every day! This photo was taken at 10:00pm as we set up our tent in the insane wind. If you ever see our van, one thing you’ll notice is the amount of adventure toys we have. From the outside, you’ll see a hybrid whitewater kayak and a trail-ready motorcycle. Inside, you’ll find two skydiving rigs, a snowboard, longboard, mountain board, pack-raft, backpacking gear, trad and sport climbing gear, rappelling/ascending gear, wetsuits (?? ), plus Callen just picked up a paraglider and will be getting his license this spring...so basically every section of REI and more is covered 😂 For this trip, we were going to go fast and light, with two 40L packs and just the essentials, but then @kokopellipackraft sent us a packraft, and our buddies we’re meeting up with wanted to do some rock climbing, and before I knew it we were bringing along a 70L haul bag full of adventure toys...classic. So, a few days ago when we drove over this epic canyon with perfectly blue water below, we came up with the idea of Callen rappelling over the edge with his packraft in tow so he could float a little section of the river. I’ll be honest, it was a little scary to watch, and I kept imagining myself trying to explain the details to a passerby in Spanish if something did go wrong, but he pulled it off (and drew a small crowd of amazed on-lookers) and did the thing. Overall, it was a short hour-or-so adventure, but it was pretty dang fulfilling and exciting. I mean, how many touristy gringos just randomly rap a 100+ foot highway bridge with an inflatable raft mid-road trip? Pacific Southwest vibes... also. I drove 14 hours today in a failed attempt to see some penguins. Talk about shook tho. Anyways, here’s Abbi soaking in the Baker confluence. If you watched my insta stories joking about hucking this V+ rapid in my packraft let the record indicate that I def hucked it. It was of the premiere echelon. I’m pretty sure this will go down as one of my favorite memories of the trip. We stayed up watching the sun set behind the mountains the night before (sunset ended around 10:30pm, wild) and then slept in the parking lot - me crunched in the back seat of our tiny rental car and Callen on his sleeping pad behind a guardrail for wind protection. My alarm woke me up at 5:15am and I peeked out to see a tiny bit of light on the mountains. It was hard to motivate out of the little car into the insane wind, but I moved myself and my sleeping bag over to the hillside to watch clouds swirl around these toothy monoliths for a little over an hour. I put on a playlist I always listen to when I’m in places I love, bundled up tight, and let the wind whip my hair as a few tears made their way down my face. After years of experiencing this place - these mountains - through others’ books, movies, and stories, it is amazing to finally be here myself. 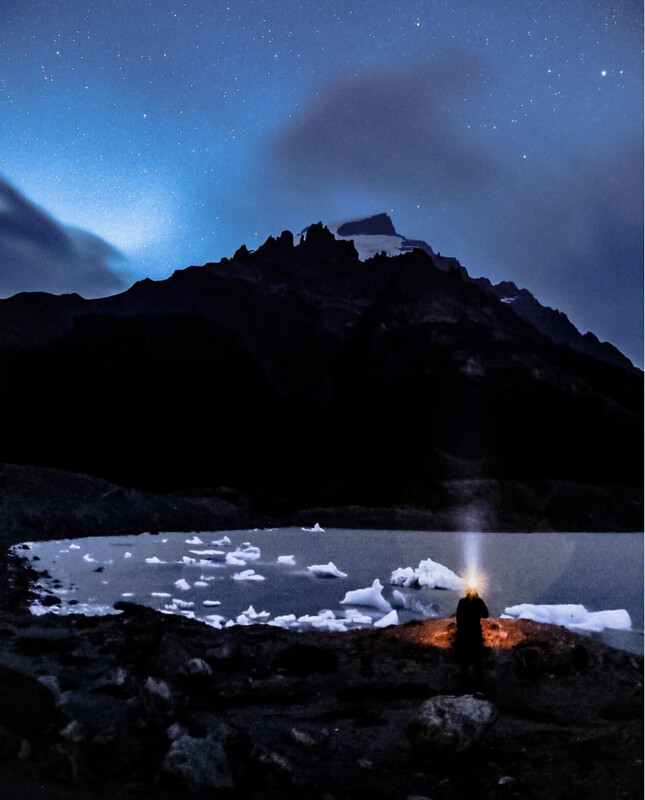 My Patagonia story doesn’t include epic night ascents, frostbite, sketchy rappels, or harrowing adventure (yet), but it’s finally my own, and that feels more significant to me than any book I’ve read. If you’re the type of person that spends years dreaming of and studying a place...do yourself a favor and go there. Whether it’s a two hour drive or a twenty hour flight, I promise it’ll be worth it. I posted about how much I was enjoying the wind out here a few days ago — we were #blessed yesterday with some 120mph gusts before leaving Torres Del Paine. Let that sink in. 120mph is how fast we go when we reach terminal velocity in a skydive. It was like skydiving on the ground 😂😂 I had to sit down at one point to avoid falling over. It was one of the most insane things I’ve ever experienced!! Also this place is stupid beautiful, I think it’s going to become an annual trip 😬 someone get married here next January and let us be your photographers/trip planners/adventure buddies, deal? I’ve spent a lot of years dreaming about this view. I never expected it to be so good. Hands down the most inspiring skyline I’ve ever seen. 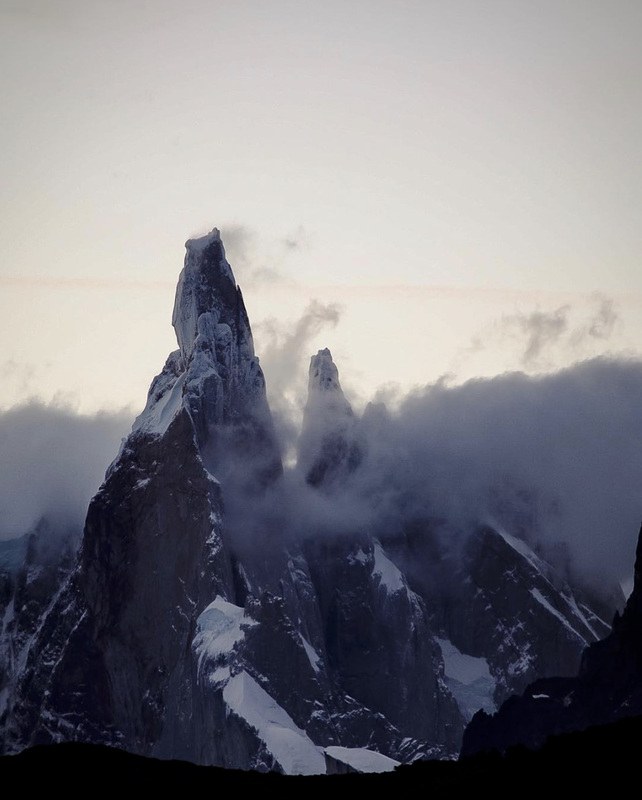 A heckin mean looking mountain, Cerro Torre rarely shows it’s gnarly face. It’s pretty staggering to consider the skills, fitness, and wizardry necessary to make an ascent. Mad shoutsout to those who have.. and have tried. Exploring a new place with friends is so wonderful. We spent the last three days hiking through the foothills of the Fitz Roy range, venturing to Glacial lakes and soaking in the wild beauty of Patagonia with our buddies Nate + Megan. They are fellow adventure wedding photographers @cedarandpines so bonus: we got a lot of awesome photos of each other all along the way. I’ll be sharing more photos of them and a few they took of us, but to start...here they are in my favorite spot of the whole trip, an iceberg lagoon at the base of Cerro Torre where we watched sunset last night and braved a rainy sunrise this morning. We spent the last three days backpacking through the foothills of the Fitz Roy range in Patagonia. It was honestly my favorite experience of the trip - nothing is more motivating than looking up and seeing Fitz towering over you. We ended the hike camped next to this glacial lagoon below Cerro Torre - which literally translates to Mountain Tower and is super super accurate (sorry you can’t see it in this photo — world’s worst weather 😉). Callen brought this @kokopellipackraft many miles into the backcountry and I honestly questioned him at first, but I have to say...paddling through small icebergs, reaching out and feeling the literally ice-cold water, listening to the ice, feeling a wave of fear with every movement, but a bigger wave of exhilaration realizing how alive the lake really is...it was my favorite outdoor experience. I will never forget how that lagoon felt. It was so real, so terrifying, and so beautiful. 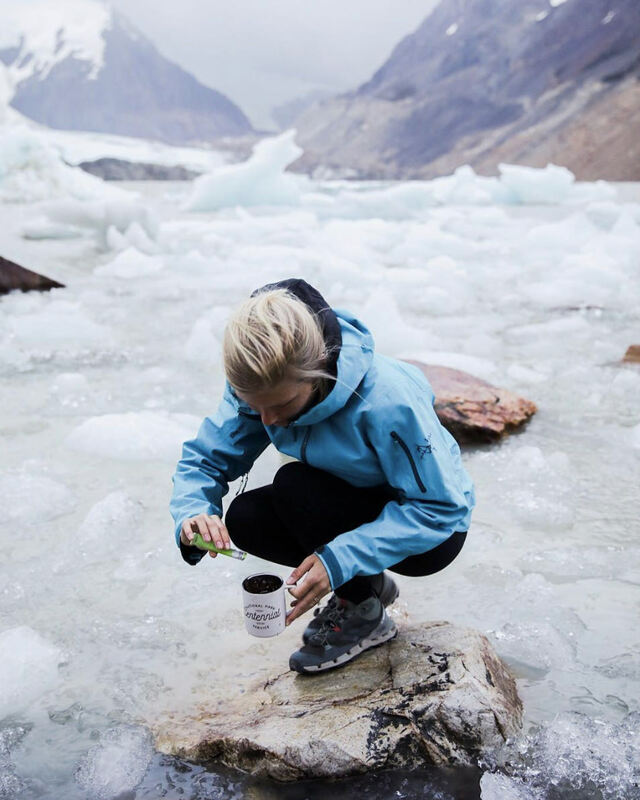 I always knew ice was my thing, but to experience it in this way completely changed me. I am eternally thankful to have been joined with amazing friends who took these photos from the shore — @megan.kantor I will forever cherish this experience and am so grateful you were there to capture it. For those of you keeping up with our travels — we made it to Argentina and now have a 19-hour layover 😵 in Buenos Aires before we fly to El Calafate (Patagonia) tomorrow morning!! The anticipation is killing me, but honestly right now I’m just haggard, running on no sleep and a lot of reeses cups. We’re literally just posting up on the floor by an outlet until tomorrow morning, so if you have any magic suggestions for making time go by really quickly (not just sleep...we’ll take turns with that) please send them my way. To quote Callen...”I really like being in places. I don’t think I like traveling” 😂 agreed babe, agreed. After three flights and one extremely brutal 19-hour layover, we finally arrived in El Calafate today more haggard than we’ve probably ever been. We wandered the town and finally secured a rental car for tomorrow after visiting three places (everyone was booked out until February!) and then made our way to some sweet little A-Frame cabins and miraculously got the last one for tonight. We’re resting, recouping, and re-motivating for our big road trip starting tomorrow! I’ll be honest, it’s tough spending a ton of money to fly to another continent for “vacation” just to feel dirty and homeless like you do in your own continent (van life probs) but I know once we get refreshed and get a little bit of sleep we’ll be stoked to hit to road and see what the hype is all about 😉 you’d think after all the books I’ve read about this place, I’d know Patagonia wasn’t going to take it easy on us. Patagonia update — we made it to El Chalten yesterday and it is absolutely amazing, but it’s famous for “the world’s worst weather” and has held to the name pretty well. We woke up this morning, hurry-packed the tent in the rain, and started driving our tiny little rental down a dirt road running through the foothills. After 37 Kilometers of foggy forest, the bluest river I’ve ever seen, a few waterfalls, and high snowy peaks in all directions, we arrived at a beautiful lake and decided to get the new 2-person packraft out for its maiden voyage. I didn’t mind the rain one bit as we paddled around a pristine mountain lake surrounded by lush forests, cascading falls, and even a few glaciers up high. 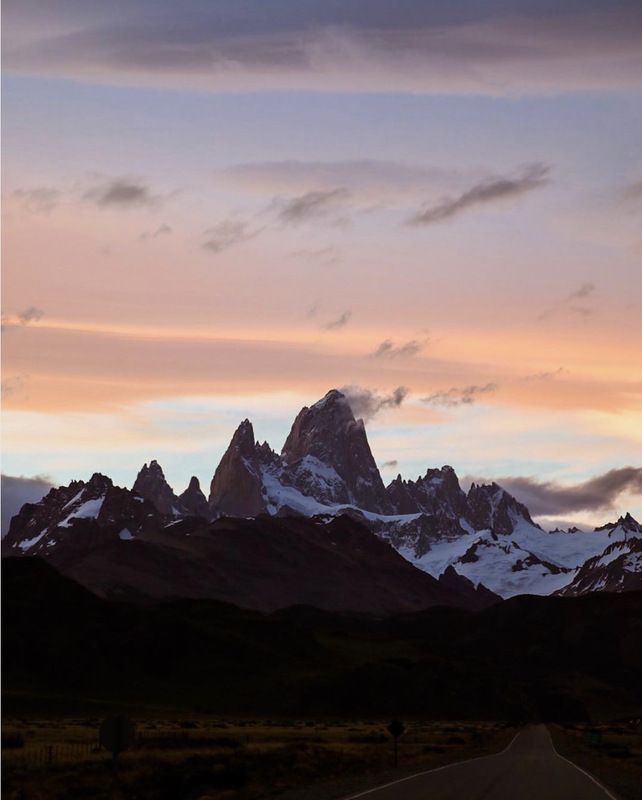 Patagonia is unreal. I am posting more photos over at @abbihearne and of course, keeping my stories updated when I can! 🖤 those of you who believe in good vibes or prayers, this may seem silly but Mont Fitz Roy has been hidden in clouds since we got here and I’m dying to see it. I really want a break in the weather so I can experience this mountain in person after staring at photos of it for years! 🙏🏻 I know expecting a break in the weather here is the silliest thing on earth, but all I need is a few minutes!! I gotta see that range. We made it to Chile! After sunrise in El Chalten early yesterday morning, we drove north on a highway that was mostly dirt road 👀 all the way to Los Antiguos near Lago Buenos Aires! This morning we crossed the border and are now eating lunch in Chile Chico planning out the next adventures. We’re planning to see the marble caves on the lake and spend the next few days driving north to hanging glacier! This place is so wild and expansive, we are having a hard time balancing the desire to see all of it and the need to rest, chill, and allow this to be an actual vacation 😉 send relaxing vibes !!! We drove across the southern tip of South America twice in the past two days and arrived in Torres Del Paine last night completely exhausted. I’ll be honest, the views were breathtaking but I was so tired and grumpy from driving so much that I didn’t really soak it in. We set up camp in a slightly delirious state and pledged to relax a little bit today. So, we’re currently sitting in the most gorgeous lodge I’ve ever seen, sipping over-priced coffee and staring out the window at huge mountains and a glacial lake so epic we can see the actual glacier across the way and a few giant icebergs floating around. What is life. Oh also - there are now 25k of you guys following along so that’s pretty dang rad 🙌🏻 Seriously, someone get married in Patagonia and bring us along. This lodge is open year-round and I am pretty certain it’s the most beautiful place in the world.